Although the Hill Collection emphasizes the ornithology of North America, it also includes numerous titles covering birds of other geographical areas of the world. A selection of 19th-century titles from the Hill and related special collections are mentioned below, in roughly chronological order. In 1824-1825 a two-volume work on new species found on a trip to Brazil, called Avium species novae, was issued by Johann Spix. Ludwig Brehm's Handbuch der Naturgeschichte aller Vögel Deutschlands appeared in 1831. A major work by Ramón de la Sagra, the Historia fisica, politica y natural de la isla de Cuba, published from 1840 to 1862 in thirteen volumes, included the Aves de Cuba, by Alcide d'Orbigny. Moving halfway around the world, Armand David's Les oiseaux de la Chine (1877) is of great interest. A history of the birds of Ceylon, by William V. Legge, appeared in 1880 and Gracius Broinowski's six-volume The birds of Australia was issued from 1887 to 1891. At the end of the century Scott Wilson's Aves hawaiiensis: birds of the Sandwich Islands (1890-1899) was published, as was The avifauna of Laysan (1893-1900), by Lionel W. R. Rothschild. While some authors concentrated on the species or geographical approaches in their writings, some concerned themselves mainly with the anatomical or morphological aspects. 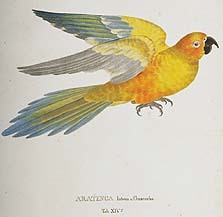 For example, in 1840 Christian L. Nitzsch described his studies on the feathers of birds in his System der Pterylographie. Interesting studies on colors of birds also appeared. Two notable ones are the Evolution of the colors of North American land birds (1893) by Charles A. Keeler, and Louis Agassiz Fuertes's typescript of his Bachelor of Arts thesis at Cornell University entitled The coloration of birds (1897).